OK, this is an oldie, but a goodie. 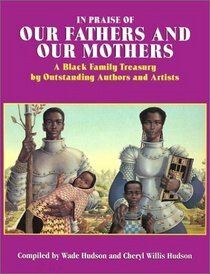 In Praise of Our Fathers and Mothers: A Black Family Treasury by Outstanding Authors and Artists, is a lovely collection of stories, written and illustrated by some of the best-known authors and illustrators of our time. The stories are complied by Wade Hudson and Cheryl Willis Hudson, and includes essays, stories, poetry, interviews, photographs and illustrations by some 40 authors and illustrators. Author contributors include Virginia Hamilton, Joyce Carol Thomas, Angela Johnson, Walter Dean Myers, Eleanora E. Tate, Mildred Pitts Walter, Tonya Bolden, Nikki Grimes, more. Illustrators include Ashley Bryan, Floyd Cooper, Leo and Diane Dillon, Tom Feelings, E.B Lewis, James Ransome, George Ford, more. My personal favorite is a story called Momma’s Kitchen Table, written by my aunt, Eleanora E. Tate. It is illustrated by Faith Ringgold. It’s a story is about my family, my grandmother, my great-grandmother, my history. In Praise of Our Fathers and Mothers would make a wonderful Mother’s Day Gift. The book must be great if Leo and Diane Dillion illustrated the cover. Our mission is to celebrate books and create lifelong readers. Your blog is a great resource for kids.